Sustainability matters to us here at Greenbelt. But so does having a beautiful festival environment. Our site vibing team work hard to re-purpose materials from one year to another. And we asked their inspiring and creative Team Leader Saga to flag up (haha) some highlights from around the site and to show how the team and its work have developed over many years. Back in Cheltenham, hundreds of flags were made to create a shimmering rainbow for Racecourse Grandstand. 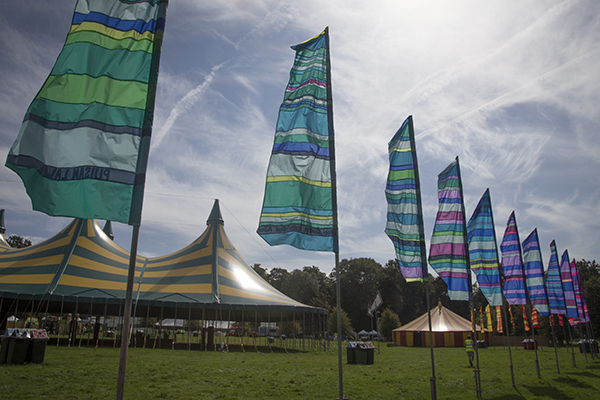 At Boughton, you can still see these flags – all along the long walkways through the campsite and into the festival village. Many of our signs have been used, year-on-year. The eagle-eyed among you may recognise The Pagoda and Playhouse signs from our Cheltenham days, too. Our hand-made bunting collection is reused each year, as well as being added to by our crafty volunteer sewers. The Art School sign last year started life as a plastic cup collection point in 2016. But, with an extensive paint-job, the addition of some giant paint brushes, and a blackboard, it became a huge notice board for outlining the Art School class schedule. The backdrop in The Canopy actually started life in the Hive, a youth venue from a few years back. We use a combination of found and recycled materials, coupled with other materials that we know will last while also adding character and pizzazz. We don’t rely only on recycled materials because it’s hard logistically to collect and store them across the year, but we do use Scrap Stores. That said, I don’t limit our material selection to those that are available from those sources. I’m mindful of their use and keen to re-use and re-purpose them to their maximum. But I think on a green site we can’t stick to an earthy palette of raw woods and earthy stains. Partly because they need to stand up and out in the natural environment, but also because often they are not light or weather resistant. When a venue sign or decorative element has done its time, and we need something new, we dismantle them and store the components, so that we can find new ways to utilise them.